1:100th scale. IP. 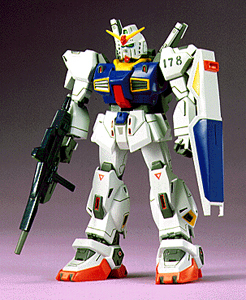 Poseable model kit of the FA-78-1 Gundam Full Armor Type. Kit No.26 in the Gundam MSV series. 1:144th scale. IP.Model kit of the MS-05 Zaku I. Kit No.32 in the Gundam 0079 series. 1:144th scale. IP. Model kit of an FA-78-1 Gundam Full Armor Type. Kit N0.10 in the Gundam MSV series. 1:100th scale. IP. Model kit of the MS-14 Gelgoog. 1:1200th scale. IP. Model kit of Gaw. Kit No. 35 in the Gundam 0079 series. Includes 2 in scale MS-06 Zaku II and 2 MSM-07 Zugock suits. 1:144th scale. IP. Model kit of an RGC-80 GM Cannon. Ki No.5 in the Gundam MSV series. 1:144th scale. IP. High Grade kit of U.N.T.Spacy Prototype Close-Combat Mobile Suit RX-78 Gundam. (This kit is the original 1990 issue not the last shot 2001 issue. Box top the same except for 'last shot' sticker). 1:144th scale. IP. Model kit of an RX-77-4 Guncannon-II. Kit No.28 in the Gundam MSV series. 1:144th scale. IP. Model kit of the MS-06S Char's Zaku II. Kit No.6 in the Gundam 0079 series. 1:100th scale. IP. Poseable model kit of the MS-06K Zaku Cannon. Kit No.17 in the Gundam MSV series. 1:144th scale. IP. 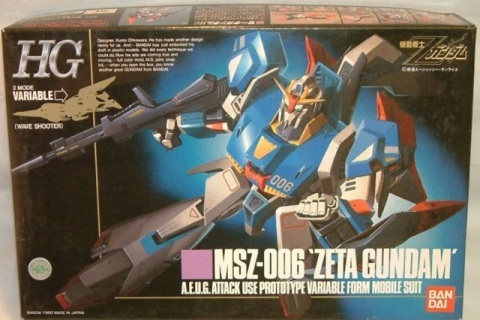 Model kit of an MS-14 Gelgoog from the Gundam 0079 series. 1:550th scale. IP. Model kit of the MAX-03 Adzam. Kit No.38 in the 0079 Gundam series. Includes in scale RX-78 Gundam & Megella Top Tank. 1:144th scale. IP. Model kit of an MSM-04G Juagg from the Gundam 0079 series. 1:144th scale. IP. Model kit of an MS-06F Zaku II. Kit No.11 in the Gundam 0079 series. 1:144th scale. IP. High Grade Model Kit of the A.E.U.G. Attack Use Prototype Variable Form Mobile Suit. Box Slightly dented - Contents Mint! 1:1200th scale. IP. Model kit of Musai. Kit No.5 in the Gundam 0079 series. 1:100th scale. IP. Poseable model kit of the MS-14S Char's Gelgoog. 1:144th scale. IP. Model kit of an RX-77-1 Guncannon. Kit No.18 in the Gundam 0079 series. 1:144th scale. IP. Model kit of the MSM-07 Char's Zugock. Kit No.21 in the Gundam 0079 series. 1:144th scale. IP. Model it of the MSN-02 Perfect Ziong. Kit No.31 in the Gundam MSV series. 1:144th scale. IP. 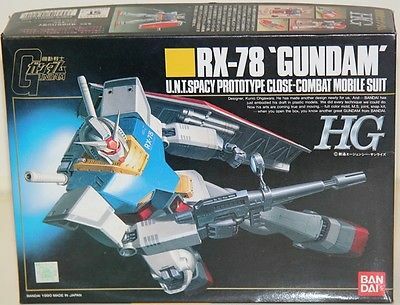 High Grade Model kit of the RX-178 'Gundam' Mk-II. A.E.U.G. Prototype General Purpose Mobile Suit. (Original 1990 Issue). 1:144th scale. IP. Model kit of the MSM-04 Alguy. Kit No.22 in the Gundam 0079 series. 1:100th scale. IP. Model kit of the RGM-79 GIMM Real Type. 1:144th scale. IP. Model of an RGM-79 GM. Kit No.17 in the Gundam 0079 series. 1:1200th scale. IP. Model kit of the Salamis. Kit No.56 in the 0079 Gundam series. Includes 3 x RGM-79 Gundams & 3 x RB-79 Balls. 1:2400th scale. IP. Model kit of the Zanzibar. Kit No.54 on the Gundam 0079 series. 1:100th scale. IP. Master Grade 20th Anniversary kit of the RX-78-2 Gundam Special Coating Version (plated parts). Includes figure of Amuro Ray and separating Core Fighter. 1:100th scale. IP. Poseable model kit of the RX-78 Perfect Gundam. Kit No.34 in the Gundam MSV series.